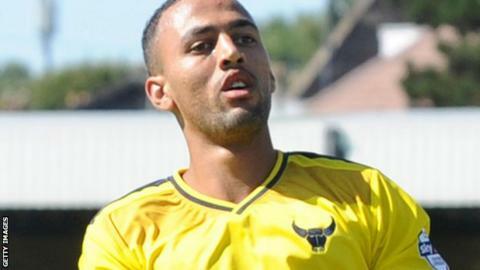 Kemar Roofe ensured Oxford returned to winning ways as he netted his sixth goal of the season in a win at York. Danny Hylton gave Michael Appleton's side an early lead as he coolly rounded York goalkeeper Scott Flinders. But confusion in the Oxford penalty area between keeper Sam Slocombe and Johnny Mullins gifted Rhys Turner a simple equaliser before the interval. Roofe pounced in the area for the second-half winner after Mullins' shot was cleared off the York line. "We're in a difficult period. We've just played two top teams that have got quality players. "But I can't ask any more from the players, attitude and application-wise. "We're looking for a little bit more quality. We're missing four players. You put them into our team and it makes us stronger. "So we've got to keep battling away and working on things we need to improve on." Match ends, York City 1, Oxford United 2. Second Half ends, York City 1, Oxford United 2. Corner, Oxford United. Conceded by Scott Flinders. Attempt saved. Ryan Taylor (Oxford United) right footed shot from the right side of the six yard box is saved in the bottom right corner. Corner, Oxford United. Conceded by Femi Ilesanmi. Attempt missed. Jordan Graham (Oxford United) left footed shot from the left side of the box is close, but misses to the left. Corner, Oxford United. Conceded by Ben Godfrey. Attempt missed. Jordan Graham (Oxford United) right footed shot from outside the box is just a bit too high. Attempt missed. James Berrett (York City) left footed shot from the left side of the box is close, but misses to the left. Attempt blocked. Rhys Turner (York City) right footed shot from the centre of the box is blocked. Corner, York City. Conceded by Jake Wright. Substitution, Oxford United. Ryan Taylor replaces Kemar Roofe. Substitution, Oxford United. Jordan Graham replaces John Lundstram. Goal! York City 1, Oxford United 2. Kemar Roofe (Oxford United) right footed shot from very close range to the top right corner. Attempt saved. Kemar Roofe (Oxford United) left footed shot from the right side of the box is saved in the top right corner. Rhys Turner (York City) wins a free kick in the attacking half. Substitution, York City. David Tutonda replaces Reece Thompson. Attempt saved. John Mullins (Oxford United) right footed shot from outside the box is saved in the bottom left corner. Attempt blocked. Danny Hylton (Oxford United) right footed shot from outside the box is blocked. Attempt missed. Kemar Roofe (Oxford United) right footed shot from outside the box is close, but misses to the right. Foul by Rhys Turner (York City).